Any book on oak tree identification will list many oak hybrids. My older copy of “Trees of Missouri” lists fifteen. Yatskievych’s “Flora of Missouri” lists forty. This is an identification nightmare. But it’s not my primary problem. Many oak leaves have lobes. 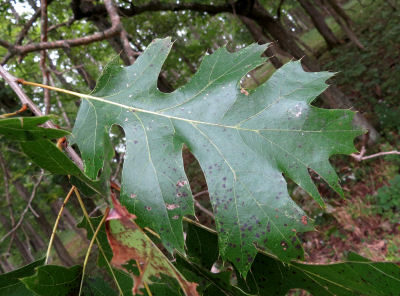 The white oak family have no prickles on the tips of the lobes and are rounded. The black oak family has the sharp tips with prickles. This leaf is from a Shumard oak. Fall is a great time to go out looking at oak trees. Their leaves are still there to aid in identification. They are starting to make their winter buds. They have acorns on them. One way to do oak tree identification is to lug the “Trees of Missouri” around through the woods. Each oak leaf is checked against the pictures. Each bud is compared. Each acorn is compared. And the tree is hopefully identified. Acorns have tannic acid in them. Those in the black oak family tend to have more and be more bitter. Indians would wash the acorn meal to wash the acid away. These acorns are from a Shumard oak. 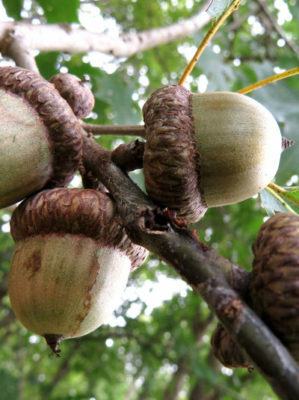 Each kind of oak acorn has its own size, shape and cup. I hate to do my oak tree identification this way. I set the book down to grab a branch. It gets scuffed and dirty. My favorite way is to take the camera out. I take the tree set of pictures: tree (if possible, those in the woods aren’t), bark, top and bottom of leaf, bud and acorn. Back at the house I bring up my pictures and go through my books. Oak trees in the black oak family tend to have darker bark. 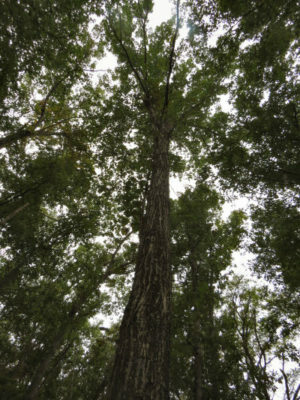 Each kind of oak tree has its own bark pattern. this is a young Shumard oak. Once I have an oak identified, I can go out again and label it. This is supposed to be the way it works. I have a problem. I am five feet tall. I have a walking staff eight feet tall with a hook on the tip. That means I can reach a branch ten feet up and pull it within reach, maybe. In the woods the oaks have their first branches over ten feet up. The trees tower over me. At most I can see the leaves well enough to tell an oak from a hickory. The trees reach up into the sky high overhead. It takes binoculars to really see the leaves. The bark may help identify the tree, but there are no other clues within reach. Acorns are no help. When an acorn falls on the hillside, it bounces and rolls. Which tree did it come from? My oak tree identification problem is getting to the leaves, buds and acorns. My only hope is to find young trees still within my reach. 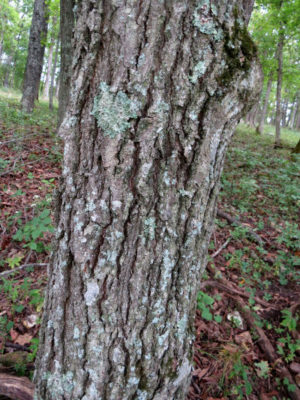 This entry was posted in Ozark Hills and tagged how to identify an oak tree, identifying oak trees, Shumard oak on September 26, 2018 by [email protected].